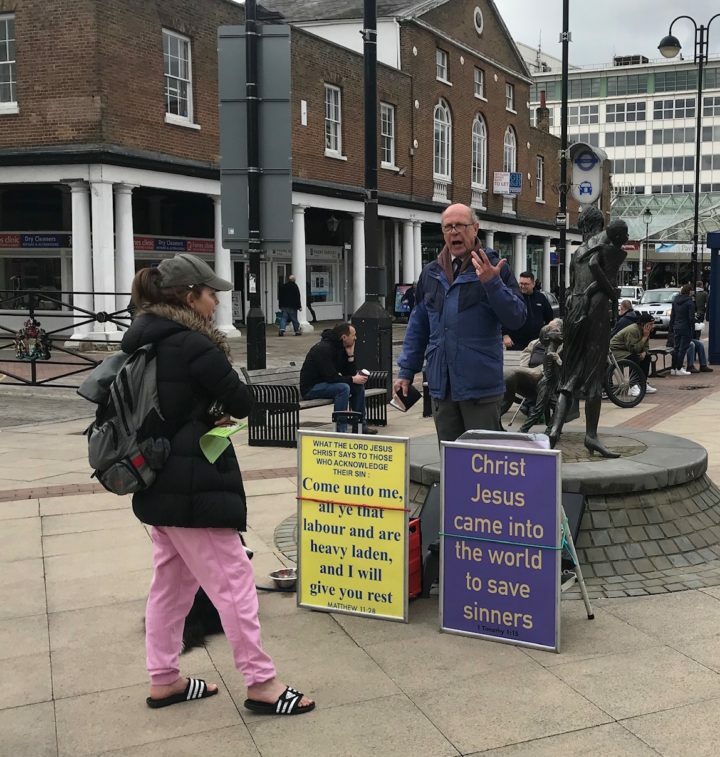 Pastors John Sherwood and Peter Simpson were preaching the gospel in Uxbridge town centre on March 15th 2019. A good number of tracts were handed out, especially by our sister Eve. At one stage, as Pastor Simpson was preaching, a man whose behaviour indicated that he was much under the influence of drugs or alcohol came up using foul language and saying how God had never stopped many bad things happening in his life, such as a fatal car crash affecting family members. The abusive nature of his approach was so shocking that one passing lady decided to call the police to give us assistance to restrain the offender. This was a refreshing change to the more usual scenario of the Police being called because people were offended by the preaching! Pastor Sherwood felt that the spirit of the man interrupting the preaching was such that her had to publicly rebuke him in Christ’s Name, rather than simply engage in conversation. A crowd was gathering around watching the altercation, and some young people started laughing. On seeing this, Eve went up to them and said, This is no laughing matter. Drugs destroy lives and that man will not reach 40, if he carries as he is doing. At this point one of the youngsters thought that he would make the following wisecrack : Which one is on the drugs, the preacher or the one shouting at him? Eve then strongly rebuked him for his insolence and rudeness towards a minister of the gospel. The young man then walked off. End of the matter? Not in God’s providence. Later a lady came up to Eve who turned out to be the young man’s mother. She said, My son has apparently been told off by someone in then high street for being rude. Eve replied, Yes, I am afraid that it was I who felt I had to speak sternly to him. The lady then told Eve how worried she was about her son because of his drug problem. This was remarkable, as Eve knew nothing about his drug problem, but had providentially rebuked him for joking about the desperately serious issue of drug dependency. Being a retired nurse, Eve then gave the mother some advice about what can be done practically to deal with her son’s problem. Eve and the concerned mother proceeded to have a really good conversation with each other, and they ended up praying together for the young man. Eve was very conscious of the Holy Spirit at work in the unfolding of these events. Pastor Simpson had a long conversation with another young man who was intelligent and well spoken, and who stated that he had taken most drugs, and thought that they should be legalised. The minister pointed out to him that to take drugs is to expose oneself to evil spirits, the Greek word for witchcraft in the New Testament being pharmakeia, from which we get our English world ‘pharmacy’ (the place where drugs are obtained). Pastor Simpson also challenged him as to why he felt the need to take them. What void was he trying to fill in his life? The young man also stated that he felt that modern society was evolving and he liked its tolerance. Mr Simpson challenged him saying, So you think society is evolving for the better? Do not all the horrors of war and genocide which the 20th century produced indicate an evolved human race behaving far better than people in previous centuries? The minister then asked, In your love of tolerance, Are you not in reality simply conforming to the prevailing political correctness of the moment? At this stage Pastor Simpson also felt it appropriate to gently mention, concerning society’s so called ‘tolerance’, that it was often a euphemism for condoning sin. For example, according to the Bible, homosexuality is sinful. On hearing this the young man immediately cut off the conversation, angrily walked off and began to shout at Pastor Sherwood (who was preaching at the time), saying what a disgusting and outrageous thing had just been said to him. This angry reaction after what had been an amicable conversation brings home to us just how obsessed contemporary society has become with the whole LGBT agenda, using the acceptance of it as the litmus test for whether anyone is a good person or not. In reality, however, the LGBT agenda is in fact a spearhead to undermine our Christian civilisation, and it constitutes a direct assault upon the God-ordained family unit. 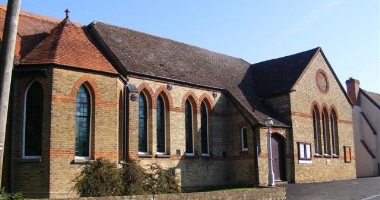 May the Lord speak powerfully to the hearts all who heard words of gospel truth in Uxbridge today, especially those with whom we had conversations.